Find Better Ideas, Faster ® with a custom voice command trend report, our PRO Dashboard and 80+ categories of premium trend reports. 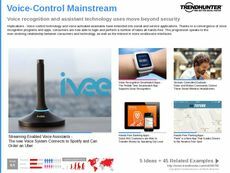 Conducting crowdsourced research in the realm of biometrics, the Voice Command Trend Report looks into software and devices that can be controlled, unlocked and authenticated using the sound of the owner's voice. The potential of this technology is maximized with smartphone virtual assistants, like Siri and Cortana, that can answer spoken questions. In combination with artificial intelligence, the report explores voice command apps, speakers and televisions. It also uncovers the technology's use in smart home designs. This report is curated in an ideal way for electronics designers, especially professionals in the mobile industry, creating smartphones with adaptations to virtual assistant programs. 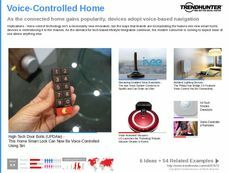 Its contents are also useful for smart home device developers, designing smart locks, connected multimedia systems and home appliances. 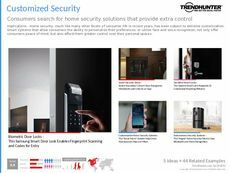 The Voice Command Trend Report will show your team how you can integrate this convenient and secure technology into any electronic device or appliance that is already made by your brand.